The Old Schoolhouse Magazine is my favorite magazine of all time. 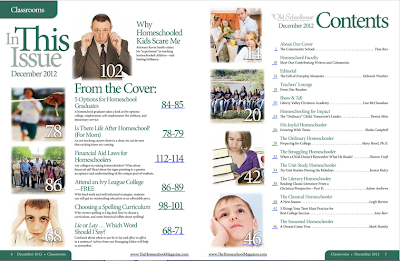 It is full of encouragement for homeschool families, and a lot of information about school subjects & curriculum. This is the only magazine that I even like all the adds. And the best part is it is FREE. You can read it on your computer or from apps on your smart phone or ereader. You will definitely want to check out the Show & Tell article on page 20 of the December 2012 issue. It is about my family!! Hope you enjoy visiting our home.